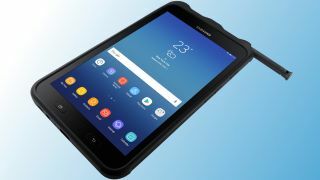 Samsung’s latest rugged tablet, the Samsung Galaxy Tab Active 2, is coming stateside following its 2017 launch in other regions. Before you get too excited, know that this model in particular puts durability over design and exciting hardware features. Unlike the Samsung Galaxy Tab S3, reportedly soon to be treated to Android Oreo, the Active 2 shares less in common with the company’s slick smartphone lineup. Targeted toward outdoor workers and B2B professionals, the Active 2 rugged tablet will make for a competent options for those who tend to put their tech through a lot of abuse in the workplace. This tablet features an 8-inch 1,200 x 800 TFT display and underneath the hood, an Exynos 7870 octa-core processor, 3GB of RAM and a massive 4,450mAh battery power the Android Nougat-flavored experience. Suited for use with gloves thanks to its physical navigation buttons beneath the screen, the Active 2 can withstand dust, water and drops at any angle thanks to its IP68 and MIL-STD-810 ratings. Our review of the 2015 Samsung Galaxy Tab Active saw that, despite its rugged build, it actually didn’t fare that well after taking several tumbles, so we’ll be sure to put its second iteration to task in the durability department. Wrapping up the final details, this model comes with an S-Pen and should you hit the ceiling of its 16GB internal storage offering, sticking a microSD card inside will alleviate that issue. The Active 2 also features user-replaceable batteries, so you can swap it out should you purchase a spare. "It (Samsung Galaxy Tab Active 2) is only available via Samsung’s IT channel partners. We have a Wi-Fi version and an LTE version, which operates on the AT&T and Verizon networks. Interested companies can contact Samsung for more information."